What are people getting on long highway runs over 100 miles, and average MPG also? What repairs have you done other than basic maintance? From fuelly.com where owners post their fuel consumption. 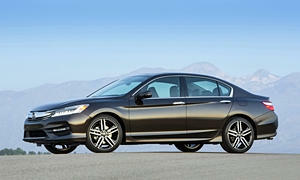 The Accord Hybrid is good for high 30's on the highway or about you can see with a turbocharged CUV with AWD. There wasn't a 2016 Accord Hybrid offered as manufacturers have to burden extra expensive to offer dual mode propulsion and why when battery tech improves we'll all be riding around in expensive electric golf carts. People are seeing an average of 42 MPG with their 2015 Accord Hybrids based on 1.2 million miles of driving. The Accord Hybrid is reliable. If you haven't bought it yet, consider the Camry Hybrid, which has a larger community. My point is that the Accord Hybrid never really sold well and it may be hard to find information about it compared to the Camry.